Home Blog What Causes Food Cravings? You’ve committed to a healthy diet. You’ve prepped your meals. You’ve counted the macros. No matter how disciplined you are when it comes to nutrition though, chances are you’ve still had to fight off food cravings. Some people crave sweets, others something salty. But what causes food cravings? And why are they so hard to resist? Let’s start by talking about Pavlov. If you aren’t familiar with the famous physiologist, he is best known for his work on behavioral conditioning. During the 1890s, Pavlov was studying the salivation of dogs in response to being fed. He noticed that the dogs began to salivate when he entered the room, even if he wasn’t bringing food. Therefore, he determined that the dogs’ salivation could be triggered by an action they associated with being fed, in addition to the food itself. This learned behavior is now known as conditioning. Humans aren’t all that different. Eating usually makes us feel good. Our brain stores this feeling as a memory and ties it to the food that accompanied it. During a food craving, your brain’s reward center is activated. It recalls the memory of positive feelings associated with food and presents it as a solution. This conditioning is particularly evident in times of stress. Unfortunately, so-called comfort foods do more damage than the temporary satisfaction is worth. Junk food, like cheeseburgers and ice cream, contain palmitic acid, a fatty acid that tells your body to ignore appetite-suppressing signals. This is why you feel like you can keep eating, and eating, and eating. But the brain doesn’t stop there. The hypothalamus plays a key role in regulating food intake and body weight. Certain brain chemicals have a profound influence on emotions, which can impact why and when we eat. Lastly, the hormone leptin is an undeniable factor. Leptin is a hormone that sends signals to the brain to control eating. Leptin levels are determined by the proportion of fat cells in your body to the amount of stored energy. Low levels trigger your appetite, while normal levels seem to all but banish the urge to eat. 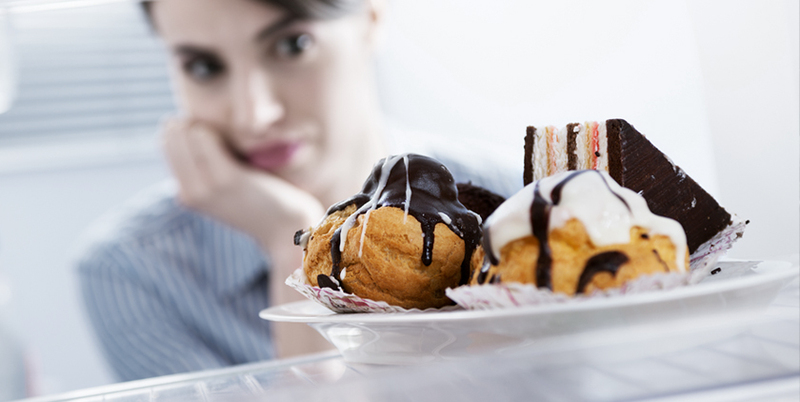 So, if your brain is to blame for all of this, is there even hope for resisting food cravings? The truth is, a balanced diet is your best defense. Eat plenty of protein and fiber to keep you full, keep nutritious snacks on hand, and avoid processed food, fast food and junk food. Training your brain to associate these foods with the reward of feeling full, satisfied and healthy, as well as to say no to the unhealthy options, will help condition you to be less susceptible.